Would you like to submit your pattern or article to Crochetvolution? Q. What are you looking for right now? A. We are currently seeking patterns and articles for our Winter issue, which will go live in December 2014. For Winter, think warm and cozy! Long sleeves, hats, layers and wool! Cardigans, pullovers, afghans and scarves, and we’d love to publish patterns for toys, jewelry, home decor, gifts and more! Think you have a winner? Send it in! We are particularly looking for clothing items in multiple sizes. Please attempt to size your pattern. (Limited help is available for resizing.) We follow CYC sizing standards. Complete information is available here. Submissions must be all or mostly crochet. If you have a great design that needs a little knitting, lining, macrame – whatever! feel free to submit it, but know that crochet is our number one priority. For articles, we’re looking for stories, tutorials, information and material that will be of interest to crocheters. Want to talk about how you got your own flock of sheep? Encourage an intro to Tunisian? Teach us how to tell whether yarn is better suited for crochet? We want to read it! We are also seeking reviews of books, yarns, tools, or other materials that may be of use to our readers. Copyright of your work always remains yours, and after the initial three months that the issue is live, you may do with it what you like. You can submit it somewhere else, publish it on your personal site, even sell it. You agree not to do it until the next issue goes up, and it will always remain here, available for free. Crochetvolution is growing, and as a result we are now able to offer contributors monetary compensation! Contributors will be receive a one-time honorarium of $25 per submission that is accepted for publication. Payments will be made via Paypal and should be expected within one month of the issue going live. In addition to the honorarium and a contributor blurb at the end of your submission, you will receive a full size banner ad for the site of your choice permanently located above your pattern or article. The graphic and link can be later updated, if needed. This site has the potential to reach tens – even hundreds of thousands – of crocheters, and that kind of targeted advertising is valuable. If you would like to provide your own graphic you can, and we will help you create one if you need it. Q. When will I find out if I got in? A. Selection of patterns and articles will begin once submissions have closed, and we will attempt to notify you as soon as possible. Q. Great, how do I submit? Pleasefollowsubmission guidelines carefully! Submissions will be edited for clarity and style. All submissions should be sent to the editor (crochetsubmissions AT gmail DOT com). All design submissions must be received by October 31st to be included in the Winter issue! Please ATTACH the following to your email, do not embed into it. A finished, written crochet pattern. Look here for a guide to our pattern format! Please ensure that your submission is in the correct format. (If you cannot view the doc file, click here for a text-only version.) 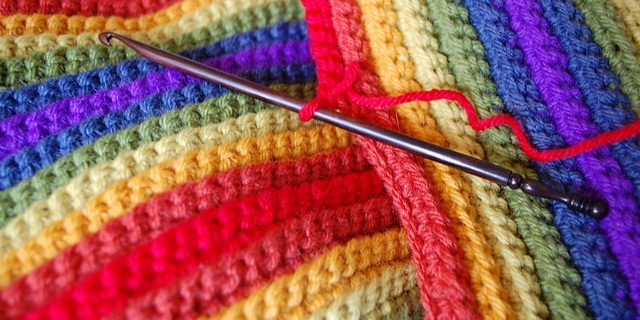 See here for a list of standardized crochet abbreviations. If your pattern requires unusual stitches/abbreviations, please explain them in the ‘notes’ section of your submission. Please also note that patterns must either be worked in yarn that is commercially available OR you must be able to suggest a commercially available alternative. Multiple high-quality digital photos of your finished design. Please send JPG images only, a minimum of 640 pixels wide. Send as many photos as you can! We need pretty shots, close-ups of details and stitch patterns, and full-length shots of the whole project. A note about photos: please make sure the pictures you send are clear and well-lit. We will not be able to evaluate your design properly if we can’t see it! Unless you have professional photography equipment, the best way to get a good photo is to use natural lighting (meaning, outside) with no flash. The flash flattens out the texture of your crocheting and makes it difficult to see the details. Not good! Please also have your item modeled, if possible – we’d much rather see your scarf on a person than on the back of a chair! Unfortunately, even if your design is spectacular, we will not be able to publish it without good photos. Please copy and paste the following text into your email message, then sign by typing your name and the date. By submitting this pattern for publication in Crochetvolution, I certify that I am the copyright holder and the original creator of this work. To my knowledge, I have not infringed on anyone’s copyright or intellectual property in the creation of this work. I also agree to hold Crochetvolution and all associated with it harmless from any and all expenses, losses, liabilities, damages, or third-party claims that may arise from any infringement or violation of such intellectual property rights. I hereby grant my permission for my pattern and images to be published in Crochetvolution in its current form and any future format in perpetuity. We would love to see tutorials of specialized techniques such as Tunisian, slip stitch, hairpin lace, tapestry crochet and more. Also welcome are personal stories or first-hand accounts of events or experiences that you think would interest crocheters. Have you researched a historical or regional aspect of crochet you’d like to share? We’d love to read about it! Written submissions must be received by October 31st, 2014 to be included in the Winter issue! Please ATTACH the following to your message rather than embedding it in it. Your complete, finished article or tutorial. Please be sure to indicate where in the piece illustrative photos should be placed. Articles should be submitted either in doc or text-only format. High-quality photos or illustrations in JPG format, at least 640 pixels wide. Well-lit, clear photos enhance the reader’s experience of your writing! In the body of your email please include contact information. Your Name (as it will be published), Email Address, URL (for your banner ad), a short bio about yourself. Don’t forget to submit a headshot of yourself! Also, please note whether you have your own 600×100 pixel image for your banner ad or you will need assistance. By submitting this article for publication in Crochetvolution, I certify that I am the copyright holder and the original creator of this work. To my knowledge, I have not infringed on anyone’s copyright or intellectual property in the creation of this work. I also agree to hold Crochetvolution and all associated with it harmless from any and all expenses, losses, liabilities, damages, or third-party claims that may arise from any infringement or violation of such intellectual property rights. I hereby grant my permission for my article and images to be published in Crochetvolution in its current form and any future format in perpetuity.